There is evidence to prove that human activity was present within what is now known as The Eastern Borders and Northumberland. The people were nomadic, as they did not build permanent houses nor erect monuments to their dead, preferring to travel across the land gathering plants and vegetables and following the herds of deer which were a source of food. Animal skin would have been used for tents and clothing whilst tools would have been from bones, stone or flint. These ancient tools can still be found in rock shelters and caves as was shown at Fairnieside Farm, near Ayton, where, in 1876, a stone age cutting or cleaving instrument was found. People started to farm and to herd animals and they constructed permanent homes as well as religious and funeral monuments. Monuments from 3000BC are located in The Eastern Borders and Northumberland, and they include: ring marks, stone circles, burial cairns and hill forts. There were the first signs of a community in the area. Evidence of this was revealed again at Fairnieside Farm when in 1968, a farmers plough opened up an adult grave which was estimated to be 3000 years old. The first Celts came to what is now Scotland, displacing ancestral settlers as the dominant group. However, the Celts, as was typical around their homelands across Europe, were never one kingdom as separate families gathered together to form tribes or clans. 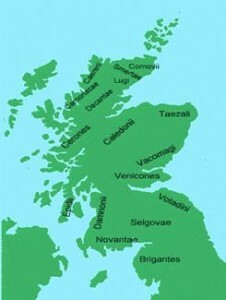 Scotland had at least 16 tribes with the tribesmen loyal to their own respective kings and queens. Those north of the Forth-Clyde isthmus were to become known as the Pictii by the Romans, or as we know call them, “Picts”. Those in the south were regarded as Brythonic/Brethonic or, as they became known, the “Britons”. The tribe which ruled what is now The Eastern Borders, the Lothians and Northumberland were the Votadini (later known as Y Gododdin by the dark ages): their capital was located on a hill in East Lothian called Traprain Law (between Haddington and East Linton just off the A1). These tribesmen and women, as well as those living in most of the area to the south of the Forth-Clyde isthmus probably spoke a language similar to the old Welsh/Brethonic tribes occupying what were later to become Wales and England. To the north of Traprain Law was another Votadinian centre called Din Eidyn, later to become Dunedin – today we call it Edinburgh. To the south it is possible that Ayton Hill with its panoramic views and fresh water supply was also used by the Votadini Celts as a base.